July 2015. Kathi Zarnack and Christian Pohl, both Junior Group Leaders at BMLS, met with 3rd-year children of two Primary Schools in Frankfurt to tell about their research. They answered questions about cells and the DNA inside and invited the children to observe different cells and small organisms under the microscope. Together with his colleagues from IBCII at the Niederrad campus, BMLS Junior Group Leader Christian Pohl welcomed 3rd-year children of the Textorschule, Frankfurt. After an introductory lecture and a Q&A session with Georg Voelcker and Christian Pohl who introduced cells as the smallest living units and how cells divide, the children had the possibility to explore how cells can be stained and observed under the microscope. In the context of the project "Junge Forscher" by the Foundation Polytechnical Society Frankfurt, BMLS Junior Group Leader Kathi Zarnack and others visited the Pestalozzi School in Frankfurt-Riederwald to tell the children about the DNA and its importance in life. Following two sessions at the school, the children were invited to visit the scientists at their place of work. Here, they could look at their own cells unter the microscope to see how DNA is stored inside the cells. 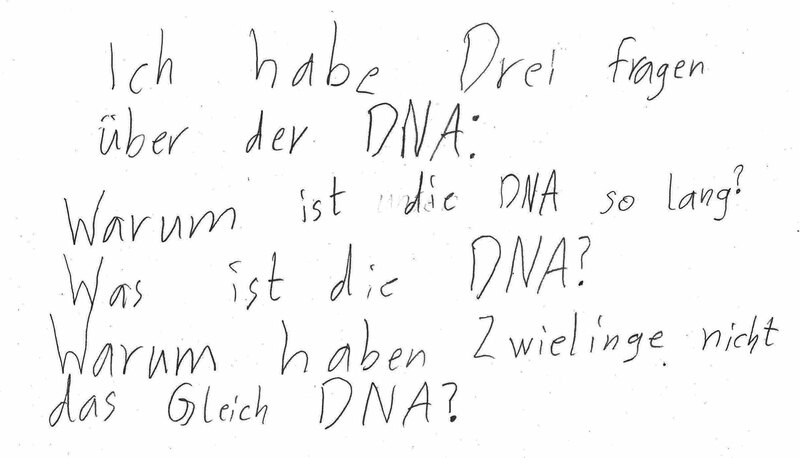 At the Pestalozzi School, Kathi Zarnack and others told the children about the structure and function of DNA and how it passes information from the parents to the children. Together with the scientists, the children played a game to understand the inheritance of dominant and recessive traits, and isolated their own DNA from oral mucosa cells. The children of class 3b at the Pestalozzi School present their experimental protocols and certificates. The children isolated their own DNA in a do-it-yourself experiment involving household chemicals, such as salt and washing-up liquid. In addition, the scientists answered the children's questions about the presence of DNA in nature and its role in criminal investigations. At the start of their visit at Riedberg campus, the children were welcomed in the lecture hall by Prof. Anna Starzinski-Powitz from the Faculty of Biology and Wolfgang Eimer from the Foundation Polytechnical Society. The visit included a guided tour to a laboratory in the Physics Department as well as a demonstration how to make icecream with liquid nitrogen. In the University Teaching Lab, the children had the opportunity to look at their own cells under the microscope. For this, they took cells from the oral mucosa and prepared them on glass slides. Connecting to the DNA isolation that they had performed at school a week before, they stained the nuclei to visualize the DNA in the cells.